Find hotel near Galeria Kaufhof Berlin Al ..
Galeria Kaufhof is one of the biggest german departmental chains in Germany. Needless to say, the Berlin brand is the biggest Galeria Kaufhof there is. The website itself is so appealing, that once you see the offers you cannot stop yourself from visiting and having a great time. The place has a lot of brands under its flagship and you can have a great time window shopping or just splurging completely on your vacation. How popular is Galeria Kaufhof Berlin Alexanderplatz? People normally club together Fountain Of Fairytales and Overkill while planning their visit to Galeria Kaufhof Berlin Alexanderplatz. I went at Global Blue (on the fifth floor) to try refund some tax, I waited about 15 min and no one appeared to service or to give some information. I needed use the WC and there was people asking for tips at the entrance of the WC, I don’t like things like that because I already had spent my money to shopping, so why do I need pay to use WC? Go, ExpLLoring And Enjoy It! 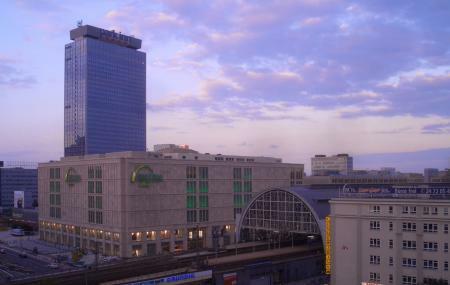 A really big shopping and departmental store right at the Alexanderplatz with views of the TV tower at the back. Great shopping experience, good and helpful staff, slightly higher prices. The food section is impressive as well. Went there to check out if they had some stuff a friend asked me to bring back for her, but wasn't even looked at by the sales associates. I took a stroll to check if they even carried the brand, they didn't. In a normal store I would have asked one of the staff members for some information, but they made me feel pretty unwelcomed there, so I just left. Maybe it was because I'm heavily tattooed, maybe they thought I don't have any money or maybe they were all having a bad day, who knows. This is a multi-level store in the heart of Alexanderplatz. Big range of assortment for clothing, food, accessories and beauty just to name a few. There is also a restaurant. It can be sometimes particularly crowded but normally it's a pleasant place for shopping. Wide choice and nice sales associates. Probably the second best selection of stuff after KaDeWe but not nearly as overpriced. Excellent meat and booze department.